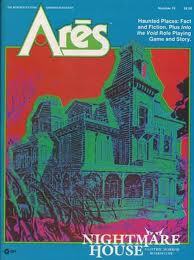 Issue #15 of Ares magazine appeared in the Fall of 1983. It's the first issue to sport a wholly new interior, one that's a lot "sleeker" than what we'd seen before. If, like me, you were a reader of "the Ares section" in Dragon, the layout should look familiar, since it survived, with some modifications the demise of Ares as an independent periodical. The new interior also looks more "user friendly" than that of the older issues, which didn't look all that different than the interiors of SPI's wargames. Issue #15 sports a cover by Jeff Easley that I actually like a great deal, though how it squares with the magazine's supposedly stronger emphasis (under TSR) on "science fiction gaming." It's even odder when one considers that this issue's editorial reiterates the division between the content of Dragon and Ares, with the former getting fantasy and the latter SF. The issue kicks off with a new feature called "Matters of Fact" by Frank Kendig. It focuses on real world science and includes sidebars on utilizing this information in gaming. "Matters of Fact" would seem to be a successor to John Boardman's "Science for Science Fiction" columns. Its less pessimistic and elitist tone is welcome, as are the sidebars, such as David Cook's treatment of Von Neumann machines in Star Frontiers. Christopher John continues to do film reviews, including a very negative one of Return of the Jedi, which he calls the "cheap and tarnished crown for the [Star Wars] series." Meanwhile, Steve List reviews games, such as Starfleet Battles and Striker, and Greg Costikyan's book review column survives yet another issue. Issue #15 features two lengthy bits of fiction, though both game-related. The first is "Visitation" by David J. Schow, which is a tie-in to this month's integral game, Nightmare House. Nightmare House, by David Marshall, bills itself as "a Gothic Horror Boardgame." It's a two to five player game set in Darkholm House, a haunted house built in the 19th century. One of the players takes the role of the evil entity that controls the House, while the other players are ghost hunters who've entered the house to banish that entity forever. There are twelve different ghost hunters from which to choose, each with their own special abilities. The game takes place on both the material and astral planes and what happens on one plane can affect the other, which add some complexity to play. The House player can throw "haunts" at the ghost hunters, in addition to trying to take possession of their bodies. Haunts are things like cold spots, animated skeletons, mysterious mists, poltergeists, and so on. Nightmare House actually looks like a fun game; I'm very tempted to try and play it. David J. Schow follows up Nightmare House with a "real world" piece on haunted houses and ghost hunters entitled "Haunted Places." It's an interesting article, but it mixes fact, speculation, and opinion together rather than merely talking about its subject matter dispassionately. The issue's second fiction piece is "Into the Void" by Carl Smith. Set in Star Frontiers game universe, it accompanies a mini-module by the same name. The adventure details a Sathar attack on a freighter carrying a valuable cargo. What's interesting to me is how extensively the module details the environment of the freighter and the tactics of the Sathar -- almost as if it were a wargame scenario. Concluding the issue is a one-page science fiction comic by Roger Raupp called "Ringshipper," which is clearly intended to be the start of an ongoing series. All things considered, I rather liked issue #15, but that's probably because it reminded me so much of the Ares section from Dragon in terms of its content and presentation. One of my biggest problems with Ares is that it never quite seemed to know what it wanted to be and often evinced an antagonistic attitude toward gameable science fiction and science fictional ideas. That attitude largely disappeared when TSR took over the editorial reins and, while I can understand why some might find the new stronger focus on SF gaming restrictive, I welcomed it and found myself looking forward to more. Sadly, there will be only one more issue of Ares before it is folded into Dragon. I might have to try to arrange for a Nightmare House, Black Morn Manor, Mansions of Madness extravaganza on Halloween. I thought RotJ was always considered to be the weakest in the series (before the trilogy, of course). Nightmare House might look interesting, but what does it have to do with Science Fiction Oo ? It probably was, but I grew up in the late 80s and mid 90s, and I think by that time the Nostalgic Sheen had settled in. By the time I was 12 the special editions were coming out, and, well, the rest you know. I always used to watch RoJ untile they saved Han and then turned it off.